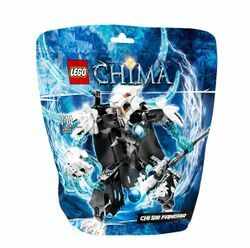 70212 CHI Sir Fangar is a Legends of Chima set released in 2014. It is not yet available in North America. CHI Sir Fangar is an ultrabuild set, meaning that its skeleton is composed of black Hero Factory elements, taking the form of ball joints and sockets attached to the ends of sticks, covered with armour. CHI Sir Fangar's torso bears a dark grey piece of chest armour. This CHI armour, found in the CHI Ultrabuild sets of 2014, allows a zamor sphere to be placed inside, representing the Chi of the various tribes. This sphere can also be ejected by pressing down on a mechanism. He has a white head moulded to resemble that of a Sabre-Tooth Tiger, and the bottom jaw is attached to the upper one with a hinge, allowing the mouth to open and close. Sir Fangar wears a black, torn up cape, and four curved transparent-blue ice spikes sprout from his upper back. His upper arms have white armour, while his lower arms are both transparent blue and lacking armour. His right arm features a large white paw with four short transparent blue claws, while his left arm has a transparent blue hand and holds a staff. The staff uses a Zamor Sphere launcher and can shoot spheres at the end, such as the blue one his is provided with. His legs feature grey armour and large white feet. Sir Fangar leads Chima's reawakened ice-oriented tribes in his evil plot. They fight the heroes across the now-snow-covered Land of Chima. This is a description taken from LEGO.com. Please do not modify it. (visit this item's product page) CHI-up and build the ultimate Sir Fangar! Hunt down rivals and launch an attack with menacing CHI Sir Fangar! This buildable CHI-powered caped warrior features snapping jaws and huge saber teeth. Pose his super-flexible limbs and flip the spikes for awesome action poses. Fire the shooting ice weapon and grab trespassers on Saber-tooth tiger tribe territory with his giant claw! Move CHI Sir Fangar’s super-flexible limbs for ferocious battle poses! Facts about "70212 CHI Sir Fangar"
This page was last edited on 9 January 2016, at 20:11.